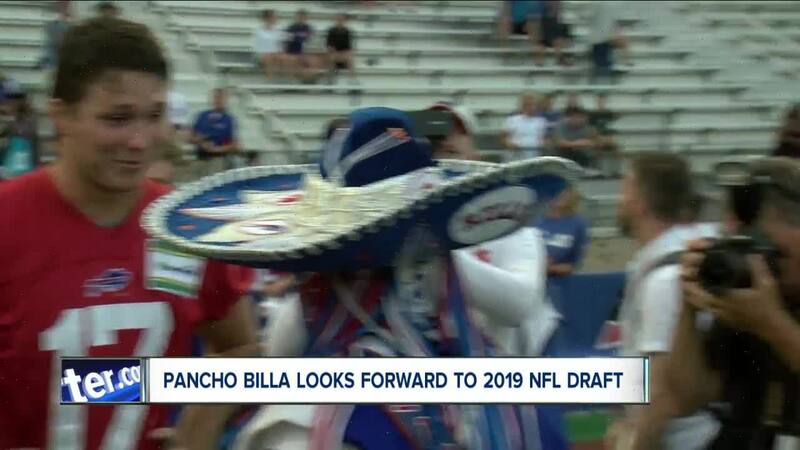 BUFFALO, N.Y. (WKBW) — Buffalo Bills superfan Ezra Castro, better known as Pancho Billa , has been offered the opportunity to announce a Bills draft pick at the 2019 NFL Draft. Former fan favorite Stevie Johnson offered Castro the pick on Twitter Saturday night, stating that Castro is the heart and soul of BillsMafia after all that he has gone through during his fight with cancer . Castro announced Friday night that his doctors saw something in his lungs following a CT scan that they didn't like and he was being admitted to the hospital. Change of Plans... scan showed something in my lungs that Dr's didnt like. I'm being admitted to hospital for further testing. Staying #PanchoPower strong & keeping the faith. Pray for all the ill'd people in the world amigos. Much Buffalove! Castro previously made a selection for the Bills at the 2018 NFL Draft. It was announced earlier this month that Johnson and Eric Wood would join former players from each of the NFL's other 31 teams announcing draft picks live in Nashville, Tennessee .